In downtown Columbia, each year a traffic box is painted into a beautiful piece of art. 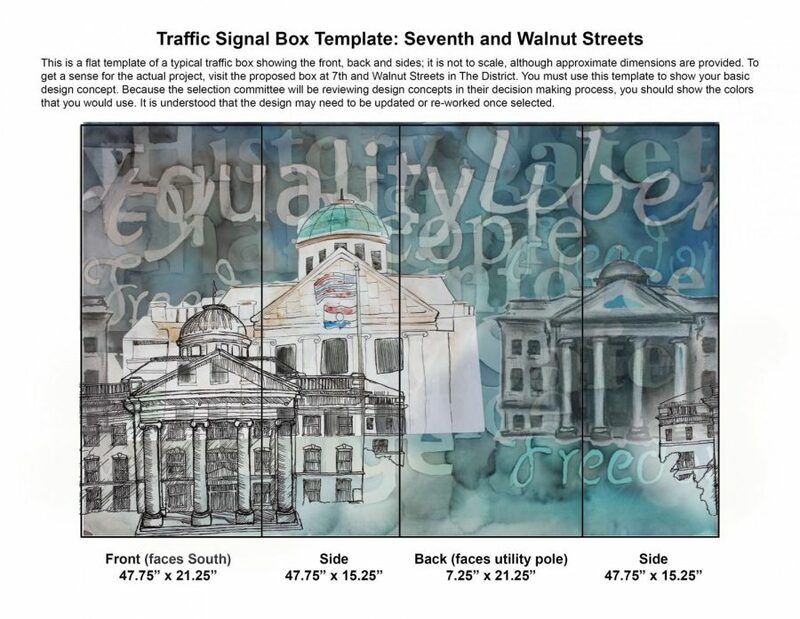 Battle has been selected to decorate the traffic box on Walnut and 7th. Jody Spriggs received a called from the Cultural Affairs Office about painting a traffic box. The process for submitting designs is very long. They submitted two designs, one with the AP 2 class and they drew what they thought represented law and order. The second design was things that showed school spirit and showed the personalities of our schools students in AP Studio Art classes. On September 28, Jody Spriggs sent in the proposals. Once they were submitted, the art classes had to wait. The proposals went through a jury process and they had to vote on many art pieces submitted for the one traffic box. On Tuesday, October 16, Battle got a call saying that the proposal representing law and order had been chosen. Three courthouses are depicted on the piece: a charcoal drawing (Julia Hamilton), a pen and ink piece (Jaiden Deubner), and a watercolor painting (Abigail Newman). The collage of the three pieces will be sent to a company that will make a vinyl wrap that will go on the traffic box. There will be a ceremony for the box when it is all done. Abigail Newman is a senior in the AP Studio Class. This isn’t Newman’s first public art piece. She was in the Care Program, a program to help middle and high school students get jobs, over the summer with the Art Gallery. They made many pieces for the city, they created a mural at Peace Park, and created art pieces for the library and sold them. She stated that when they first heard about the proposals they were not really expecting anything, but when they found out they got chosen, they were excited. Newman was the artist of the watercolor courthouse. “[Mrs. Spriggs] gave us our best medium, she kind of told us what to do. I love watercolor, and she based it off of the works we usually do,” she said. Amanda Harms, a professional artist in Columbia, created a traffic box in May 2018. “It was my first public art piece, so I had some research to do to figure out how I wanted to approach the design and painting and what materials to use. I also learned what is was like to be a professional artist working with the city,” she said. “I think it was the cobblestone road beside it that made me think, History. I knew the MKT Trail had once been the MK & T Railroad line before the tracks were pulled up and made into a nature trail. So, I researched trains that would have come into Columbia, tried a few different approaches, and decided on now what is on the traffic box,” Harms said. Artists find inspiration in a lot of places. Spriggs came up with the law and order because the traffic box is between the Columbia Police Department and the Courthouse. Battle’s artists that help created the piece were very excited when they found out the proposal that was sent in got chosen. The proposal is at a company getting the vinyl print and there should be an opening ceremony for the box when it is finished.